Today's Monday Map looks at the "marriage penalty" aspect of state income tax systems. In a progressive tax system, higher incomes are taxed at higher rates, and in states where the same tax brackets apply to both single and married filers, the effective tax rate on the combined income of two earners can be significantly more than if the two incomes were taxed separately. 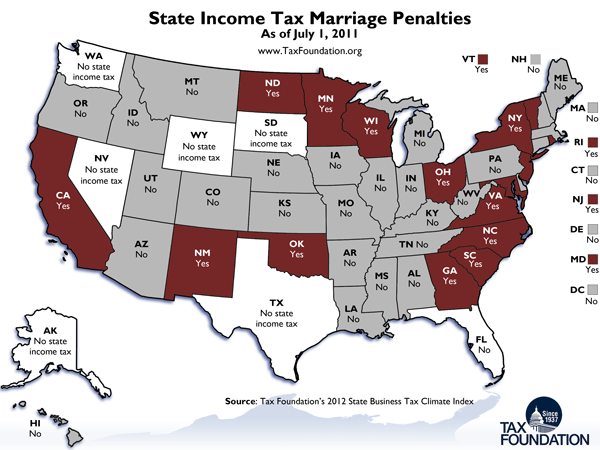 In 2011, sixteen states had some form of marriage penalty in their income tax system.